What's the Best Time To Install an Above Ground Pool? Best Time to Install an Above Ground Pool? Any time is a good time, of course, spring and summer are the seasons that most people think of. 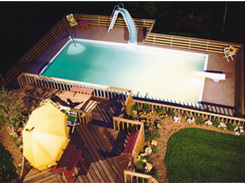 The warmth and sunshine are our natural impetus to want to think about backyard swimming pools. Many people are surprised to learn, however, that we ship our Aqua Star Deck-Pool and Olympic-Eagle on ground pools and above ground swimming pools year round. The reasons are multifold. Ground conditions are firmest and driest at different times of the year across the country depending on terrain and weather patterns. Firmer and drier ground translates to a faster and cleaner installation. Consequently, less property disruption is incurred and less landscape restoration is required afterward. Install an Above Ground Pool? Because late autumn is ideal for landscaping, laying sod and plantings, a mid-to-late summer installation easily coincides with the landscape and deck work that needs to be done anyway. What this means, is you and your family can begin enjoying your new above-ground pools right away. Also, remember, swimming pools above-ground installed late in the year will still be your family. First Year with their new pool. Its something the kids will enjoy immensely this year and give them something to look forward to during the winter months. In general, have your pool installed as soon as possible. The kids will enjoy it longer. They won’t be this young forever, and one day the grandkids will be coming over, too!